Good Beer Week might not be returning until May, but it's never too early to get excited for Australia's largest celebration of beer. 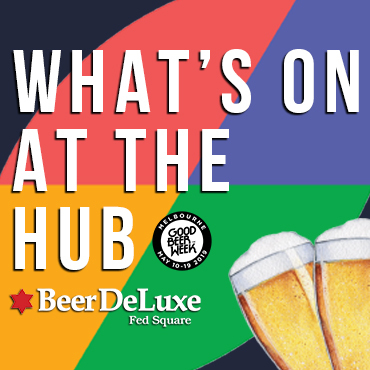 The Good Beer Week Gala Showcase heralds the launch of the program for the ten-day beer festival and also gives you a chance to sample heaps of great beer. Held at the Atrium at Federation Square, the 2019 Gala is taking place over three sessions on Friday and Saturday, March 15 and 16. The Showcase will feature 30 breweries from around Australia pouring more than 100 different beers, as well as food vendors and masterclasses. Tickets cost $50pp, which get you 20 tasters, a food voucher and your very own Good Beer Week Rastal mini-Teku glass to take home. Favourites such as Stone & Wood, Pirate Life, Little Creatures and Boatrocker will be mixing it with up-and-comers that include Molly Rose Brewing and even gluten free brewery TWØBAYS Brewing Co.
Tickets to the showcase are available from 9am on January 24.